The frames, B, and the wheels, G, are secured upon the hollow shafts, so that they can not move independent of each other. 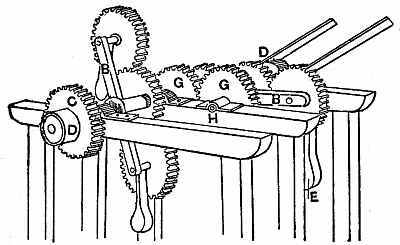 Shafts are placed within the hollow shafts, H, upon which the communicating wheels, D, and the center wheels are secured, so that they can move independent of the frames, B, and wheels, G.
While the frames, B, make one revolution, the wheels, D, and the center wheels make two revolutions. This is caused by the action of the weighted levers E. Their weight, or inertia, prevents them from passing around the center of the axis of the wheels with which they are suspended in the revolving frames. The full force of this resistance, or inertia, is applied to the other wheels of each set, and by these wheels communicated to the center wheel.